Belarus (officially called Republic of Belarus) is a country in Eastern Europe. About nine million people live there. Its capital is Minsk. It was part of the Soviet Union until 1991. The president of Belarus has been Alexander Lukashenko since 1994. It is bordered by Russia, Ukraine, Poland, Lithuania and Latvia. Over forty percent of its 207,600 square kilometres (80,200 sq mi) is forested. "FAO's Information System on Water and Agriculture". FAO. Retrieved 4 April 2008. The State is a member of the UN, the CIS, Collective Security Treaty Organization, the Eurasian Economic Community, the Union State of Russia and Belarus (from 2 April 1997), as well as a member of other international organizations. Until the 20th century, the lands of modern-day Belarus belonged to several countries. These included the Principality of Polotsk, the Grand Duchy of Lithuania, the Polish–Lithuanian Commonwealth, and the Russian Empire. After the Russian Revolution, Belarus became part of the Soviet Union. It was renamed the Byelorussian Soviet Socialist Republic (BSSR). The borders of Belarus took their modern shape in 1939. Some lands of the Second Polish Republic were added into it after the Soviet invasion of Poland. The nation and its territory were devastated in World War II. Belarus lost about a third of its population and more than half of its economic resources. In 1945 the Belorussian SSR became a founding member of the United Nations, along with the Soviet Union and the Ukrainian SSR. The parliament of the republic declared the sovereignty of Belarus on 27 July 1990. 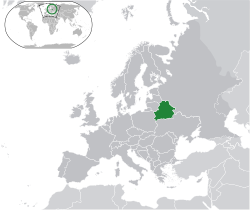 During the dissolution of the Soviet Union, Belarus became independent on 25 August 1991. Over 70% of Belarus's population of 9.49 million live in the urban areas. More than 80% of the population are ethnic Belarusians. Most of the rest are Russians, Poles and Ukrainians. The country has two official languages: Belarusian and Russian. The main religion in the country is Russian Orthodox Christianity. The second most popular, Roman Catholicism, has a much smaller following. Both Homo erectus and Neanderthal remains have been found in the region. From 5,000 to 2,000 BCE, Bandkeramik cultures lived here. Cimmerians were in the area by 1,000 BCE. By 500 BCE, Slavs moved in. The Huns and Avars came through around 400–600 CE. They were unable to move the Slavs. The region that is now Belarus was first settled by Slavic tribes in the 6th century. They came into contact with the Varangians, who were bands of Scandinavian warriors and traders. They formed Kievan Rus' in 862. When Kievan Rus' ruler Yaroslav I the Wise died, the state split. Later some were added into the Grand Duchy of Lithuania. Lithuania made a union with Poland. The union ended in 1795. The land of Belarus went to the Russian Empire. The land stayed with Russia until going to the German Empire during World War I.
Belarus said they were free from Germany on 25 March 1918. They formed the Belarusian People's Republic. Then the Polish–Soviet War started. A part of Belarus under Russian rule became the Belorussian Soviet Socialist Republic in 1919. Then it added to the Lithuanian–Belorussian Soviet Socialist Republic. Other lands were divided between Poland and the Soviet Union after the war ended in 1921. The Belorussian SSR became a founding member of the Union of Soviet Socialist Republics in 1922. The western part of modern Belarus stayed part of Poland. In 1939, Nazi Germany and the Soviet Union invaded Poland. This was the beginning of World War II. Parts of Poland were added to the Belorussian Soviet Socialist Republic. They are now West Belarus. Nazi Germany invaded the Soviet Union in 1941. BSSR was the hardest-hit Soviet republic in World War II. During that time, Germany destroyed 209 out of 290 cities in the republic, 85% of the republic's industry, and more than one million buildings. Casualties were between two and three million. The population of Belarus did not come back to its pre-war level until 1971. Joseph Stalin wanted Belorussian SSR to be more Russian. Russians were sent from other parts of the Soviet Union to be in the government. The use of the Belarusian language was limited. After Stalin's death in 1953, Nikita Khrushchev continued the plan. In 1986, the Belorussian SSR had nuclear fallout from the explosion at the Chernobyl power plant in neighboring Ukrainian SSR. Belarus said it was free on 27 July 1990. With the support of the Communist Party, the country's name was changed to the Republic of Belarus on 25 August 1991. Belarus is landlocked and mostly flat. It has a lot of marshy land. Many streams and 11,000 lakes are found in Belarus. Three major rivers run through the country: the Neman, the Pripyat, and the Dnieper. The highest point is Dzyarzhynskaya Hara at 345 metres (1,132 ft). Belarus has a hemiboreal humid continental climate (Dfb in the Koeppen climate classification). Natural resources include peat deposits, small amounts of oil and natural gas, granite, dolomite (limestone), marl, chalk, sand, gravel, and clay. About 70% of the radiation from neighboring Ukraine's 1986 Chernobyl nuclear disaster entered Belarusian territory. The farmland continues to be affected by radiation fallout. Belarus is a presidential republic. It is governed by a president and the National Assembly. Lukashenko has described himself as having an "authoritarian ruling style". Western countries have described Belarus under Lukashenko as a dictatorship. The Council of Europe has stopped Belarus from membership since 1997 for undemocratic voting. The Armed Forces of Belarus have three branches: the Army, the Air Force, and the Ministry of Defense joint staff. Lieutenant General Yuri Zhadobin heads the Ministry of Defense. Alexander Lukashenko (as president) is Commander-in-Chief. Belarus is divided into six regions. They are named after the cities that are their administrative centers. Most of the Belarusian economy is state-controlled. It has been described as "Soviet-style." The country relies on Russia for some imports, including petroleum. As of 1994, Belarus's main exports included heavy machinery (especially tractors), agricultural products, and energy products. According to 2009 census, the population is 9,503,807. Ethnic Belarusians are 83.7% of Belarus' total population. The next largest ethnic groups are: Russians (8.3%), Poles (3.1%), and Ukrainians (1.7%). Minsk, the nation's capital and largest city, is home to 1,836,808 residents as of 2009. Gomel, with 481,000 people, is the second-largest city and is the capital of the Homiel Voblast. Other large cities are Mogilev (365,100), Vitebsk (342,400), Hrodna (314,800) and Brest (298,300). For other places in Belarus see List of settlements in Belarus. Belarusian literature began with 11th- to 13th-century religious scripture. By the 16th century, Polotsk resident Francysk Skaryna translated the Bible into Belarusian. The modern era of Belarusian literature began in the late 19th century. One important writer was Yanka Kupala. Several poets and authors went into exile after the Nazi occupation of Belarus. They would not return until the 1960s. The last major revival of Belarusian literature was in the 1960s with novels published by Vasil Bykaŭ and Uladzimir Karatkievich. In the 19th century, Polish composer Stanisław Moniuszko made operas and chamber music pieces while living in Minsk. At the end of the 19th century, major Belarusian cities formed their own opera and ballet companies. The National Academic Theatre of Ballet, in Minsk, was awarded the Benois de la Dance Prize in 1996 as the top ballet company in the world. Rock music has become more popular in recent years, though the Belarusian government has tried to limit the amount of foreign music aired on the radio. Since 2004, Belarus has been sending artists to the Eurovision Song Contest. The traditional Belarusian dress is from the Kievan Rus' period. Due to the cool climate, clothes were made to keep body heat and were usually made from flax or wool. Belarusian cuisine is mainly vegetables, meat (especially pork), and breads. Foods are usually either slowly cooked or stewed. A typical Belarusian eats a light breakfast and two hearty meals, with dinner being the largest meal of the day. Wheat and rye breads are eaten in Belarus. Rye is more plentiful because conditions are too harsh for growing wheat. To show hospitality, a host will give an offering of bread and salt when greeting a guest or visitor. Popular drinks in Belarus include Russian wheat vodka and kvass, Kvass is a drink made from fermented malted brown bread or rye flour. Kvass may also be added with sliced vegetables to create a cold soup called okroshka. Belarus has four World Heritage Sites: the Mir Castle Complex, the Nesvizh Castle, the Belovezhskaya Pushcha (shared with Poland), and the Struve Geodetic Arc (shared with nine other countries). ↑ "President of the Republic of Belarus". Retrieved 30 October 2016. ↑ 4.0 4.1 4.2 4.3 "Belarus". International Monetary Fund. Retrieved 20 April 2011. ↑ UN Statistics Division (1 April 2010). "Standard Country and Area Codes Classifications (M49)". United Nations Organization. Retrieved 22 April 2010. ↑ Abdelal, Rawi (2001). National purpose in the world economy: post-Soviet states in comparative perspective. Cornell University Press. Retrieved 10 November 2009. ↑ Taylor & Francis Group (2004). Europa World Year, Book1. Europa publications. Retrieved 10 November 2009. ↑ 16.0 16.1 16.2 Axell, Albert (2002). Russia's Heroes, 1941–45. Carroll & Graf Publishers. p. 247. ISBN 0-7867-1011-X. ↑ "About Belarus – Population". United Nations Office in Belarus. 2003. Retrieved 7 October 2007. ↑ Plokhy, Serhii (2006). The Origins of the Slavic Nations. Cambridge University Press. pp. 94–95. ISBN 0-521-86403-8. ↑ Robinson, Charles Henry (1917). The Conversion of Europe. Longmans, Green. pp. 491–492. ↑ Scheuch, E. K.; David Sciulli (2000). Societies, Corporations and the Nation State. BRILL. p. 187. ISBN 90-04-11664-8. ↑ Birgerson, Susanne Michele (2002). After the Breakup of a Multi-Ethnic Empire. Praeger/Greenwood. p. 101. ISBN 0-275-96965-7. ↑ Olson, James Stuart; Lee Brigance Pappas, Nicholas C. J. Pappas (1994). Ethnohistorical Dictionary of the Russian and Soviet Empires. Greenwood Press. p. 95. ISBN 0-313-27497-5. ↑ Ioffe, Grigory (25 February 2008). Understanding Belarus and How Western Foreign Policy Misses the Mark. Rowman & Littlefield Publishers, Inc. p. 57. ISBN 0-7425-5558-5. ↑ Marples, David (1999). Belarus: A Denationalized Nation. Routledge. p. 5. ISBN 90-5702-343-1. ↑ Sorge, Arndt (2005). The global and the local: understanding the dialectics of business systems. Oxford University Press. Retrieved 10 November 2009. ↑ Minahan, James (1998). Miniature empires: a historical dictionary of the newly independent states. Greenwood Press. Retrieved 10 November 2009. ↑ Baron, Nick (2004). Homelands: war, population and statehood in Eastern Europe and Russia, 1918–1924. Wimbledon Publishing Company. Retrieved 10 November 2009. ↑ 31.0 31.1 Fedor, Helen (1995). "Belarus – Stalin and Russification". Belarus: A Country Study. Library of Congress. Retrieved 26 March 2006. ↑ Fedor, Helen (1995). "Belarus- Perestroika". Belarus: A Country Study. Library of Congress. Retrieved 26 March 2007. ↑ Country Studies Belarus – Prelude to Independence. Library of Congress. Retrieved 21 March 2007. ↑ 34.0 34.1 34.2 "Belarus – Geography". The World Factbook. Central Intelligence Agency. 2007. Retrieved 7 November 2007. ↑ Rainsford, Sarah (26 April 2005). "Belarus cursed by Chernobyl". BBC News. Retrieved 26 March 2006. ↑ "Profile: Alexander Lukashenko". BBC News. 20 March 2006. Retrieved 26 March 2006. ↑ Mulvey, Stephen (10 September 2001). "Profile: Europe's last dictator?". BBC News. British Broadcasting Corporation. Retrieved 21 December 2007. ↑ "High-ranking Military Officials of the Republic of Belarus". Ministry of Defense of the Republic of Belarus. 2006. Retrieved 22 December 2007. ↑ "Section IV:The President, Parliament, Government, the Courts". Constitution of Belarus. Press Service of the President of the Republic of Belarus. 2004. Archived from the original on 17 December 2007. Retrieved 22 December 2007. ↑ "Section I: Principles of the Constitutional System". Constitution of Belarus. Press Service of the President of the Republic of Belarus. 2004. Archived from the original on 17 December 2007. Retrieved 22 December 2007. ↑ United States Government (2007). "Background Note: Belarus". United States State Department. Archived from the original on 14 November 2007. Retrieved 7 November 2007. ↑ Dr. Kaare Dahl Martinsen (2002). "The Russian-Belarusian Union and the Near Abroad" (PDF). Norwegian Institute for Defence Studies. NATO. Retrieved 7 November 2007. ↑ Library of Congress (1994). "Belarus – Exports". Country Studies. Retrieved 4 November 2007. ↑ World Gazette Largest Cities of Belarus (2007). Published in 2007. Retrieved 19 March 2007. ↑ "Classical Music of Belarus". Belarusguide.com. Retrieved 2013-04-29. ↑ National State Teleradiocompany Page on the 2004 Belarusian entry to the Eurovision Song Contest. Published 2004. Retrieved 18 March 2007. ↑ University of Nebraska-Lincoln – Institute of Agriculture and National Resources. Situation and Outlook – People and Their Diets. Published in April 2000. Retrieved 21 March 2007. ↑ "Belarus – UNESCO World Heritage Centre". Retrieved 26 March 2006.